My black principal told me she was hoping to “fix” my relationship relationship with him, so that our “friendship” could be mended. That may not seem like a logical scenario, but in fact, our black principal agreed with him, and even said that ‘reverse racism’ exists towards white people “but it’s just called racism.” She said that he was entitled to his express his own opinion on matters such as affirmative action, which affect the lives of people of color directly. In many situations, being black is very hard, especially in environments like my “liberal” private high school where there is limited, or even restricted, representation of our race. For me, it’s been unbearable coping with people who used their privilege and power against me in ignorant and illogical ways. I deal with this on top of the stress of needing to be as good, or greater, at my academic subjects as everyone else so that I can be seen as equal in comparison to my white classmates. Junior year, I started the International Baccalaureate diploma program. My stress levels became almost unmanageable, and I could barely stay on top of my work. However during that chaos, my art emerged and counteracted this sudden increase in tension. IB Visual Art was the first visual art class I had taken since 8th grade, and the art I created began serving as an outlet to the stress and injustice I faced outside of the art studio. In this class, we created art on topics such as our personal context and also created pieces whos intents were based on the artistic medium’s qualities. I realized that there could be a therapeutic nature present in the creation of artwork, as well as in the artworks themselves. I can truly express myself and my thoughts through art, and I developed an interest in political art and self portraits. This mostly stemmed from my participation in a speech competition, in which I happened to become a national winner. In this competition I saw how we, even as young adults, can affect the world significantly through activism. I felt that I could make a difference through everything I do after meeting others who were national winners. I realized that I could change the world not only through delivering speeches but also through the creation of art, which I had previously only used to make changes in my personal life. After my speech, I felt that it could now also become something that could change the life of people around me as well. Art has also been a way for me to take a break from the stress of my other classes. 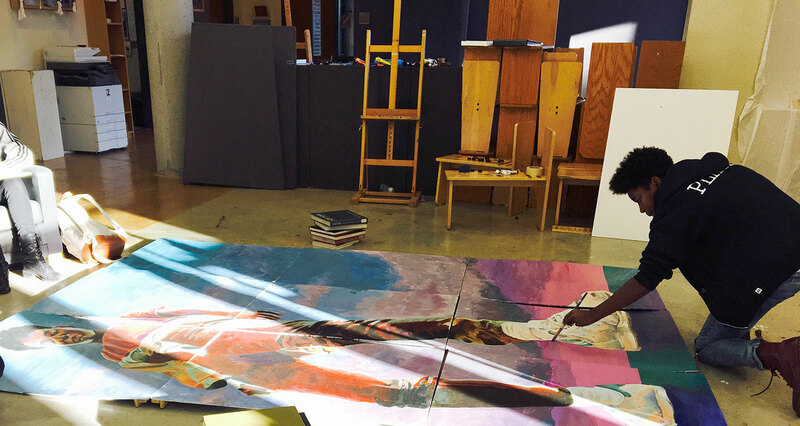 I can always mindlessly paint or draw in my free blocks, and work on something that felt wasn’t my academic work. An artist does not have to censor themselves. 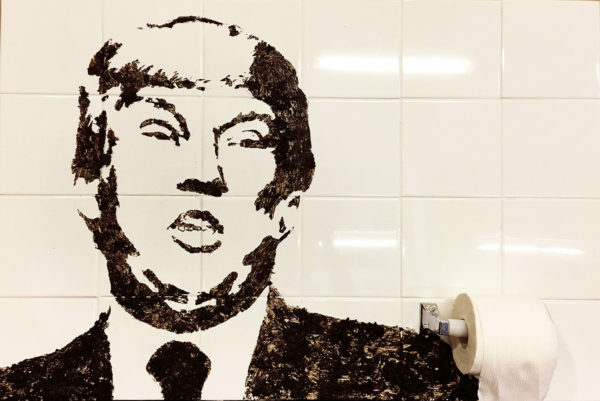 Making bold, impactful, and even offensive statements through one’s artwork can bring attention to the artist and their point of view. I experimented with this approach through my artwork, especially my political pieces and self-portraits. In one of my self-portraits, I wanted to focus on how other people perceive me. I created a 7’ x 10’ painting, where I was looking down angrily at the viewer, as a commentary on how people have perceived me incorrectly. Partly due to my height, but also possibly due to my race, many people have seen me as mean and/or scary. The painting also symbolizes the emotional barrier that exists between myself and others which exists so that I can shield myself from prejudice. 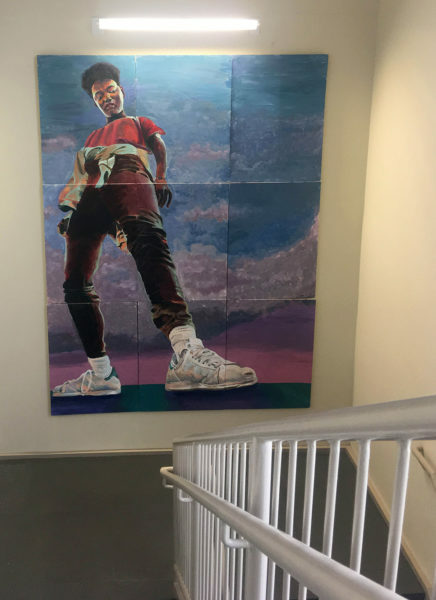 I hung this painting in a stairway in my school, so that as someone walks up the stairs, the first thing they see is me, dominating the space. Creating self-portraits was a way for me to increase visibility of the black struggle in my community. I was also able to include more representation of black people in art, which is something I don’t see much. When making art, there are no limitations. Art acts as a way to express yourself in whatever way you please: without the social biases, restrictions, imbalances that exist in our society. Use your art as an outlet, look at each of your artworks as if it has no boundaries, and as something which can impact the world.